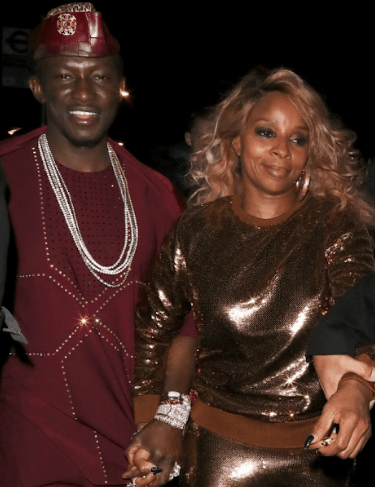 Nana Kwame Bediako, a Ghanaian business tycoon and serial entrepreneur stepped out with American artiste Mary j Blige at the just concluded British Academy Film Awards 2019 (BAFTAs) on Sunday Februrary 10, 2019 looking very dashing in a custom made piece by Nigerian designer Ugo Monye. Nana Kwame Bediako who is the founder and CEO of the Kwarleyz Group, capturing brands such as New Africa Construction, Belfast City & Property Management, Wonda World Estates, Petronia City Development and the New Africa Philanthropic Foundation, while concurrently serving as Co-Principal of the recently-launched Capital Nine Zero (CNZ) looked just like Mary J Blige’s man, lol. Anyone else sees this too?